Should You Charge Sales Tax for Your Classes? As much as you’d like to charge clients based on the value of wellness you bring into their lives, there are more tangible, hard costs that must be calculated. Things like studio rent, instructor’s pay and sales tax are all factors in determining how much you need to charge for class to ensure you cover your expenses and earn profit. While your facility’s bills and staff pay are straightforward costs you have some degree of control over, sales tax laws are complicated and non-negotiable. There is no nationwide rule about how much sales tax you have to pay on the money you make for classes. Some state governments collect a sales tax on memberships, but others do not. For example, the state of New York currently does not charge a sales tax on memberships, but New York City imposes a 4.5% city sales tax for memberships, dues or initiations fees. However, studios that offer yoga classes only — and no other type of fitness or hybrid class —are not subject to the New York City local sales tax. 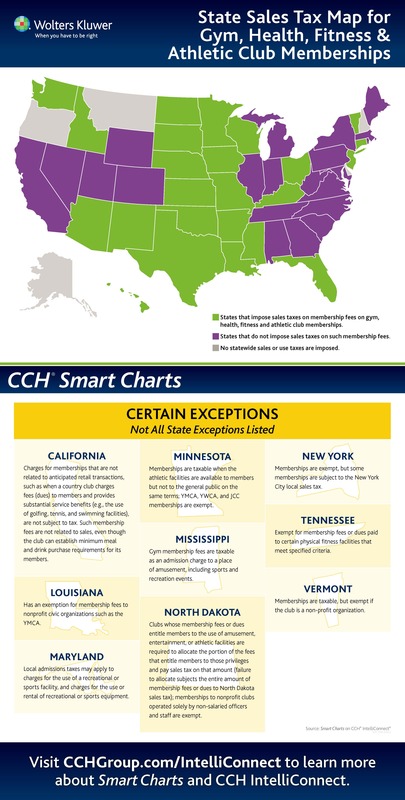 Other states that charge sales tax include Connecticut, Florida, Missouri, New Jersey and Texas, plus Washington, D.C.
To ensure you are paying the correct amount of taxes to your state each year, work closely with your accountant to make sure he or she understands how your fees work and what types of services your members are paying for. Understanding what you will owe on all the types of services you provide will help you determine what you should be charging clients. It’s also important to clearly communicate any sales tax that clients must pay at the point of sale. For example, if you have online class registration and a client wants to renew for a $100 class package, make sure you clearly say the fee will be $100 plus tax. If your studio has a retail component, you should be collecting sales tax on those purchases. State departments of taxation are going to look at more than the taxes you are collecting and, subsequently, paying to them. They are also going to look at the taxes your studio is paying on the purchases you buy. E-commerce has given states increased ammo for performing audits on businesses. If your studio bought equipment or supplies tax-free online or in another state, you must pay tax on that purchase in your home state. It’s called a use tax. So while you think you may be saving money by making purchases in states with no sales tax—and you claim that purchase as a business expense—the chances are increasingly high that your state department of taxation could come after you to pay that tax. According to a recent report, 45 states have a use tax, but only 1.6 percent of the taxpayers in those states actually pay the use tax. When it comes to sales and use tax, the laws are incredibly complex. To protect your business from a state audit, penalties or fees, it’s best to be proactive about managing these taxes. Meet with your accountant to discuss sale and use tax, and develop a plan for not only charging and paying the tax appropriately but documenting sales and purchases correctly as well.